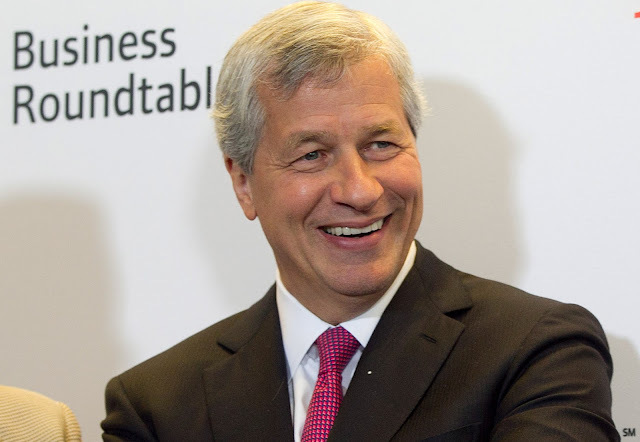 EconomicPolicyJournal.com: Jamie Dimon Becoming Major Player in D.C.
Jamie Dimon Becoming Major Player in D.C.
JPMorgan Chase & Co Chief Executive Jamie Dimon is not bad as far as high-level cronies go. He gets it most of the time. And he is pretty sound on economics and almost always comes down on the right side of issues. Now, it appears he is increasing his role in Washington D.C.
Dimon is starting to look like Corporate America's shadow president. more than a dozen trips to Washington so far this year to press a broad agenda with a range of influential policymakers, people who attended the meetings or are familiar with his schedule said. Dimon has already visited the nation's capital four times as much as he does in a typical year. His ramped-up presence comes after taking the helm of the Business Roundtable, a lobbying group that represents CEOs of large U.S. companies, in December. "We couldn't ask for a more engaged or more effective Business Roundtable chair," said Joshua Bolten, former chief of staff for President George W. Bush, whom Dimon installed as the organization's president and CEO. The frequency of his trips, and the wide range of policies he has been discussing, have started chatter among power brokers in Washington and on Wall Street about how much energy Dimon is devoting to issues beyond JPMorgan. At times, they said, Dimon carries himself more like someone running the country than someone running a bank. "If you're Jamie Dimon, you've always had access," said Tim Pawlenty, CEO of the Financial Services Roundtable, a Wall Street trade group. "The difference is, now he wants it. He wants to play a role in policy more broadly than just representing his company." [When]Senator Richard Durbin...championed a rule that slashed debit card fees...Dimon ...called [him] "downright idiotic." It is always sad to see corporate leaders spending time in Washington but as long as the government gets more and more intrusive into business, the more it makes sense for corporate CEOs to spend time in D.C. to protect their businesses from predatory government. The danger, of course, is that once cozy with those who control the levers of power they will use that power to restrict competition. And at least he's got good teeth.